No joke. Valor awards are relatively scarce. If you are looking to identify ribbons or medals or any other uniform items, it's handy to have a book on the subject. 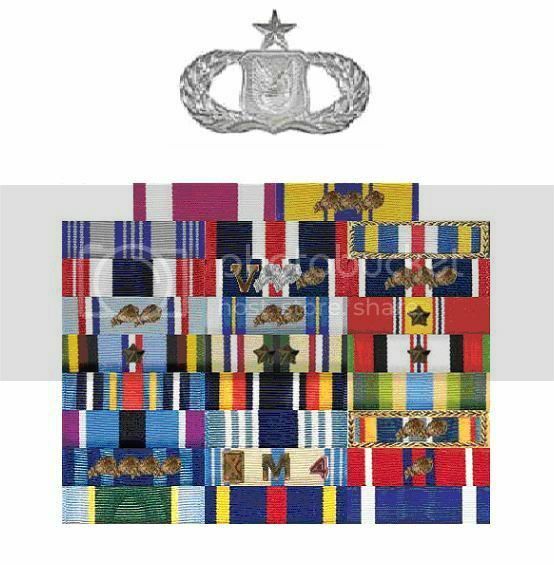 If you don't yet have one, there are some good MilitaryMedals resources online. I agree with you 100% "if we are going to war we should prepare from the neck up along with from the neck down, especially if we have to be on foreign land!!" I was in the Gulf War which has been compared to the Korean War as far as length and violence, but I and we still have mental issues along with physical. and a Purple Heart that for some reason does not want to be posted???? For some reason it shows a Germany flag for me, it just asked where I lived, and I'm stationed in Germany. Just wanted to clarify. The reason why you don't have the GWOT-E is because you received the Afghanistan ribbon instead. The GWOT-E is mostly for areas outside of Iraq and Afghanistan. Unless you deployed to one of those countries before there was a medal for them, in which they would have given you both (Iraq and GWOT-E, or Afghanistan and GWOT-E) once they were introduced. device on my Arcom. 2 OLC on my AAM. 2 Campaign stars on my OIF ribbon.